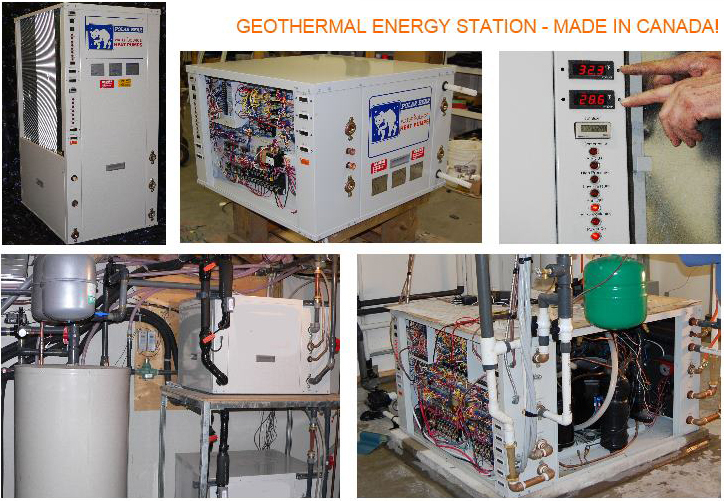 Geothermal Energy StationTM is a prefabricated, self-contained energy station for outdoor application which includes high efficient water to water heat pumps, dual circulators with VFD’s and integral controls, valves, air separator, piping and a Central control system. Geothermal Energy StationTM sits between Geothermal Energy Reservoir and Building distribution loop. Utilizing the Geothermal StationTM, the building loop temperature could be massaged to such a degree, that the temperatures needed to provide excellent efficiency for cooling and heating would be maintained forever. Geothermal Energy Station can be built in mechanical room as central plant. 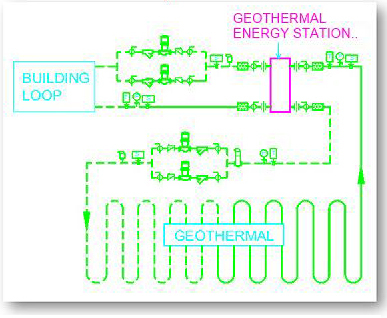 How Geothermal Energy Station Works? Building loop base set point temperature to be not less than 104ºF and shall increase on a ramp based on outside air temperature to a maximum of 122ºF. Heating shall be control from return water temperature sensor.During start of heating cycle the central building controller will energize the loop pumps which will ramp Up/Dn based on their integral controller input to maintain required system flow and the master water to water heat pump controller will energize the available heat pumps (not in cooling mode) along with corresponding 2 position valves to maintain minimum temperature setting of 104ºF. On a building heat demand the master water to water heat pump controller will energize heat pump on as needed basis to increase loop temperature to maximum of 122ºF and maintain this temperature throughout the season. When building heating demand will satisfy the main pumps reduce the speed to maintain require system flow and the master water to water heat pump controller will de-energize the heat pumps. In a scenario when no call for heating the central building controller run at minimum system flow in order to maintain loop set point temperature. To achieve this each floor piping headers are equipped with by-pass and differential pressure transducer (DPT) and regulating valve. During off season the entire heating system will be in off mode. Building loop base set point discharge temperature to be 44ºF. Cooling shall be control from building return water temperature sensor. On a building cooling demand, the central building controller will energize the loop pumps which will ramp Up/Dn based on their integral controller input to maintain required system flow and the master water to water heat pump controller will energize the available heat pumps (not in heating mode) along with corresponding 2 position valves to maintain temperature setting of 44ºF. When building cooling demand will satisfy the main pumps reduce the speed to maintain require system flow and the master water to water heat pump controller will de-energize the heat pumps. In scenario when no call for cooling the central building controller run pump at minimum system flow in order to maintain loop set point temperature. To achieve this each floor piping headers are equipped with by-pass and differential pressure transducer (DPT) and regulating valve. During off season the entire cooling system will be in off mode. Water to water heat pump will be equipped with a desuperheater and an integrated circulating pump that can provide Supplemental Domestic hot Water (SDW). 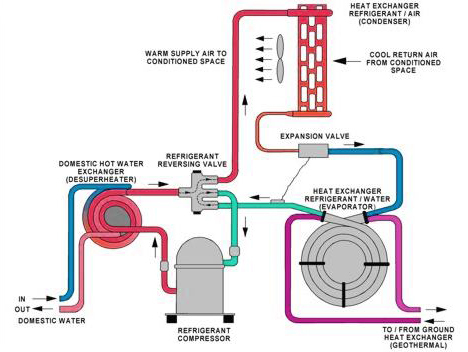 This is done by stripping heat from the superheated gas leaving the compressor. In addition on heating demand the central plant will operate dedicated water to water heat pump in heating mode to increase tank temperature to 120oF. Geothermal Energy StationTM reject excess heat which will be collected by the Geothermal Reservoir during summer operation in order to lower its temperature when outdoor air temperatures are low at night or in winter by just running the circulating pumps exchanging the heat energy via heat exchanger using Thermal Energy Rejector System. No central water to water heat pump energizes to achieve this task besides they will satisfy building heating and cooling demands. This process allows a large volume of Geothermal Reservoir to achieve significantly lower temperature which can be maintained over the winter till spring and used in summer for the building to reject heat to – this permits natural cooling of the building at a fraction of the cost of air conditioning. Geothermal Energy Station<sup>TM </sup> absorb excess heat which will be collected by the Geothermal Reservoir during summer operation in order to increase its temperature by just running the circulating pumps exchanging the heat energy via heat exchanger using Thermal Energy Absorber System. No central water to water heat pump energizes to achieve this task besides they will satisfy building heating and cooling demands. This process allows a large volume of Geothermal Reservoir to achieve significantly higher temperature which can be maintained over the Summer till Fall and used in Winter for the building heating - this permits natural heating of the building at a fraction of the cost without burning fossil fuel. By comparing traditional HVAC Central system, the Geothermal Energy Station<sup>TM </sup> works as an integral part of Hybrid Geothermal increases the Coefficient of Performance (COP) of Central Water to Water heat pumps or distributed heat pumps by 25% and energy efficiency ratio (EER) by 40% while significantly reduces carbon emissions year round.